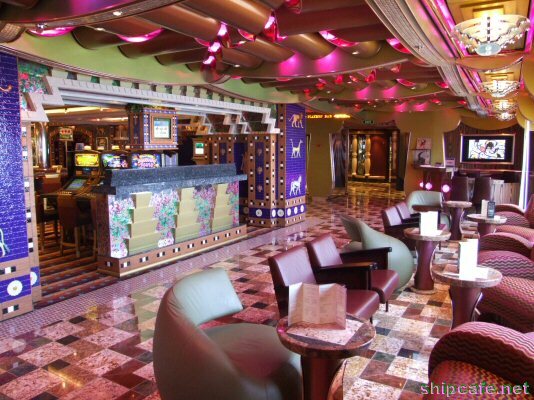 Just aft of the Victoriana Lounge on Promenade Deck, the Fun Shops of Carnival flank the Millennium on both port and starboard sides. 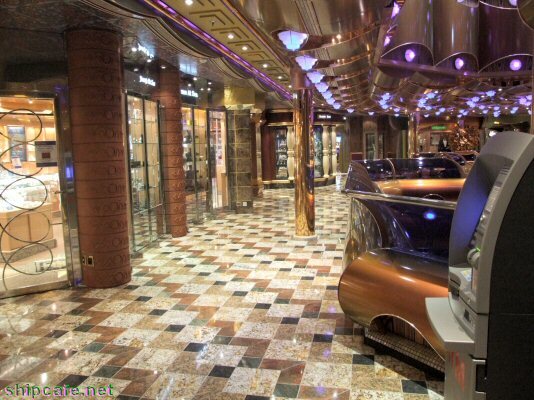 Guests can shop for a number of items throughout such as sundries, logo items, liquor, and evening wear. 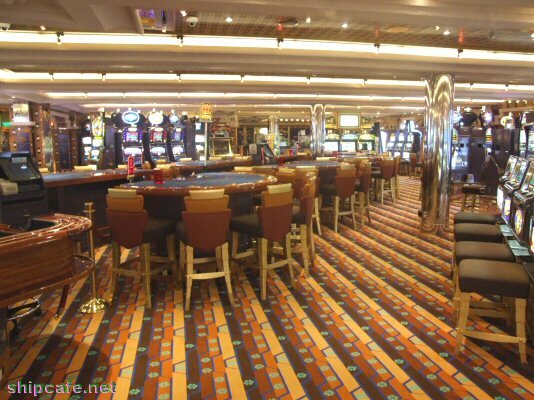 The Players' Bar is nestled between the shops and Carnival Freedom's Babylon Casino. 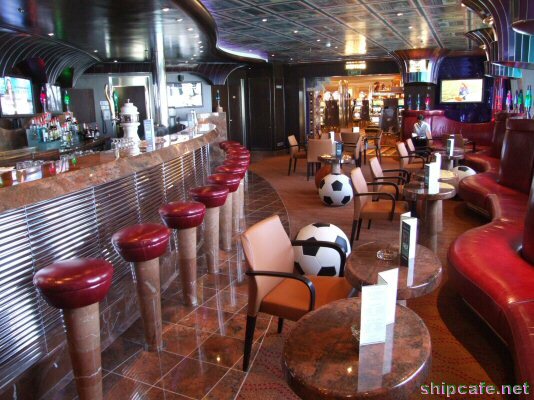 The Players' Bar is a salute to the happy days of 1950s sports. Photographs of legendary teams adorn the ceiling while modern technology, such as plasma screen televisions, are located over the bar. 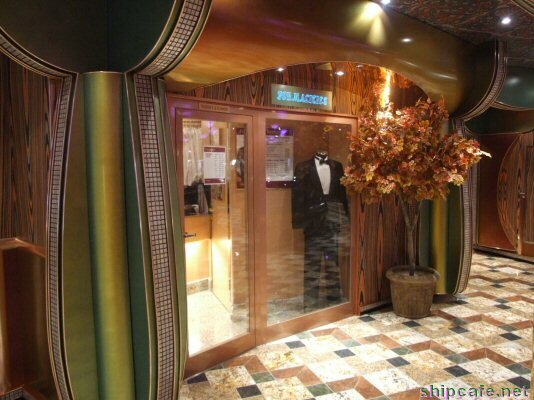 The Babylon Casino features replicas of the fabled Ishtar gates through which guests pass to experience the granduer of King Nebuchadnezzar II. The gates are made of blue glazed brick embellished with golden renderings of mythological creatures. Floral accents are painted on stainless steel slot machines and brick columns throughout are enhanced with winged figures. 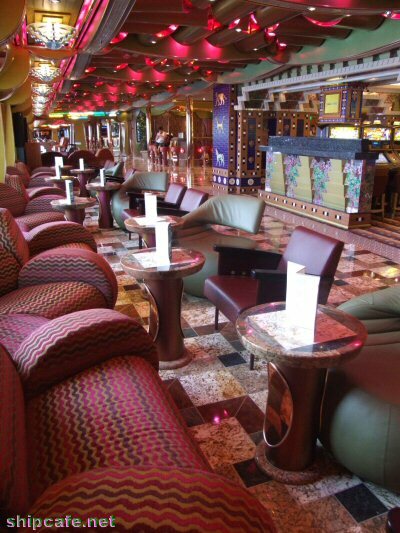 The Centuries is Carnival Freedom's main promenade and hosts a wide array of public entertainment areas. 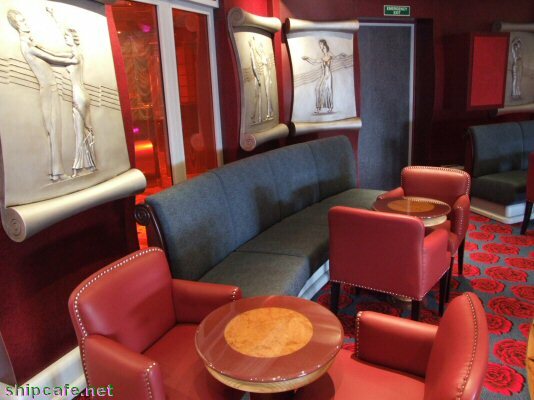 The Centuries Bar provides seating for guests and also serves as a service station for the Babylon Casino. A kiosk is located just aft of the Centuries Bar and serves to be an information center or, when cruising Europe, a currency exchange desk. Along the Centuries is also the Viennese Cafe, which is a very popular venue for guests looking to order a specialty coffee and enjoy a gourmet pastry. 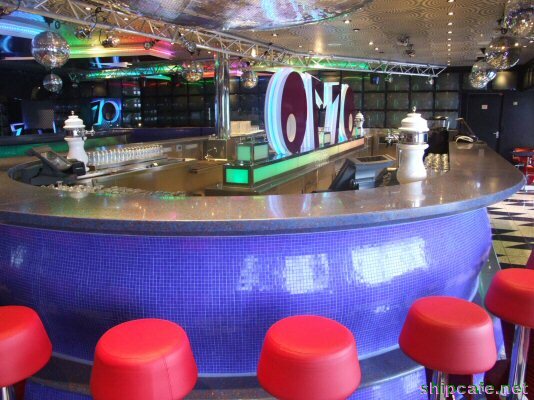 Just adjacent to the Viennese Cafe is Club O2. 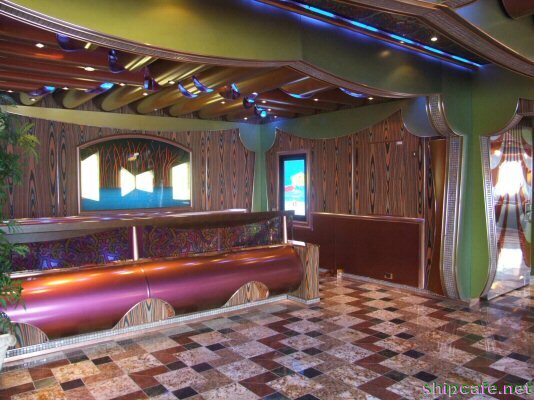 Club O2 is a facility of more than eighteen hundred square feet of fun for guests 15 to 17 years of age. Teens can enjoy non-alcoholic beverages and choose from thousands of tunes at the listening stations. 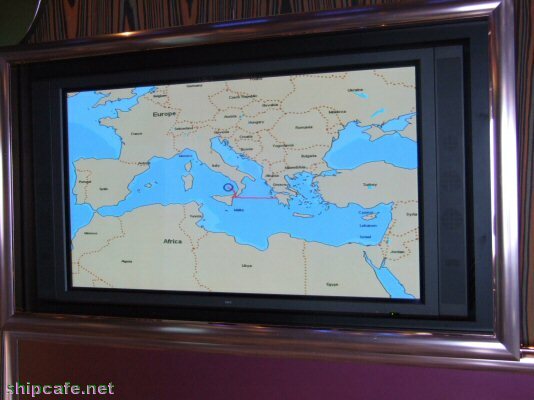 There are also a sixty inch plasma televisions where teens can watch movies. In the interactive game pod within Club O2 teens can play the hottest video games. 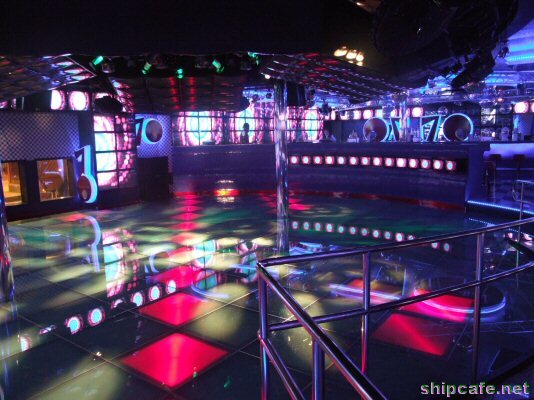 By night, the club comes alive as a teen discotheque. 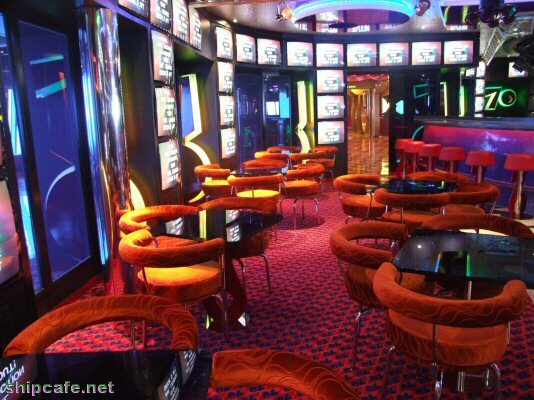 Next to Club O2 is a video game room, also including air hockey tables. Meiji Sushi is a nod to Japan of the 1860s, when the nation had become more westernized and moved away from its shogun heritage. 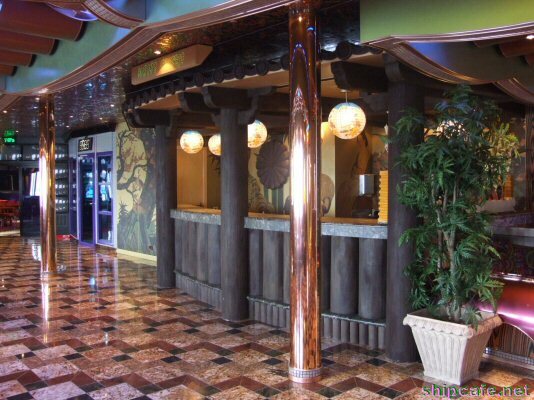 Ceramic wall tile murals feature Japanese scenes from the Meiji period and the area is highlighted with the symbol of the Japanese emperor, the chrysanthemum. Glazed ceramic roof tiles top a Japanese style beamed ceiling. Bar Nouveau wine bar aptly boasts Art Nouveau style decorations. 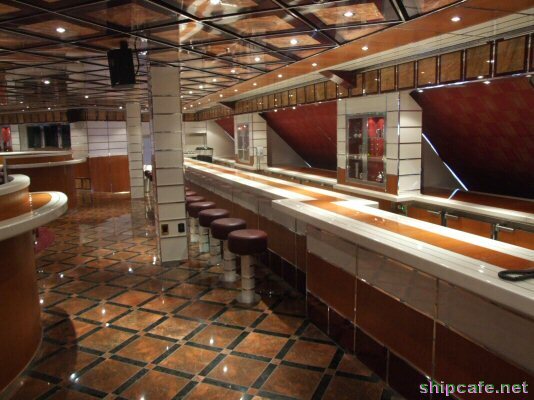 Above the bar is a stained glass, backlit dome that looks down on inlaid marble walls. 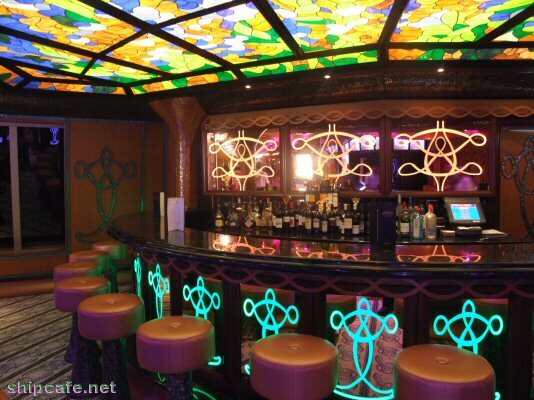 The bar front sports a mirror etched with Art Nouveau patterns. The 70s Disco is a nod to retro but does not necessarily always feature only music from the era. 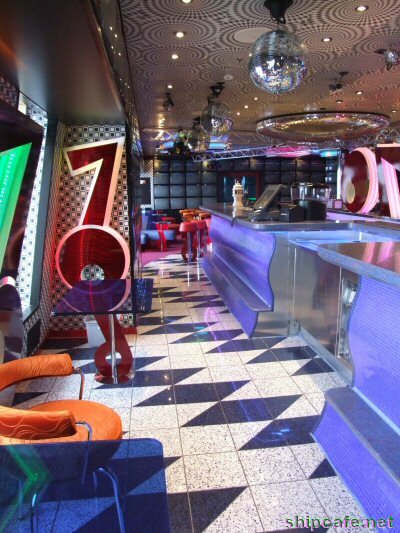 The 70s Disco is a twist on the inspiration from the legendary New York disco Studio 54. An industrial motif with black walls create a stark contrast for the fanciful disco lights, while spotlights reflect from giant mirrored balls that project upon dancers on the dance floor. Sofas that are created in shapes to spell '70s' recall a time of upholstered seats and a glass back, while stainless steel bar stools provide perches. 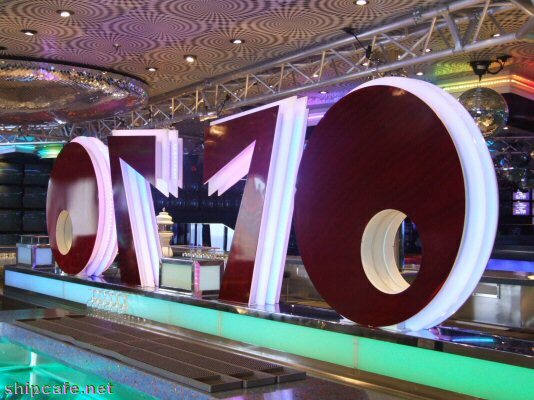 Giant '70s' figures are located prominently throughout the nightclub to emphasize the mood. Video monitors line the walls throughout the 70s Disco and continue outside of the room as well onto The Centuries. This feature involves guests passing by and even encourages them to join in the fun. 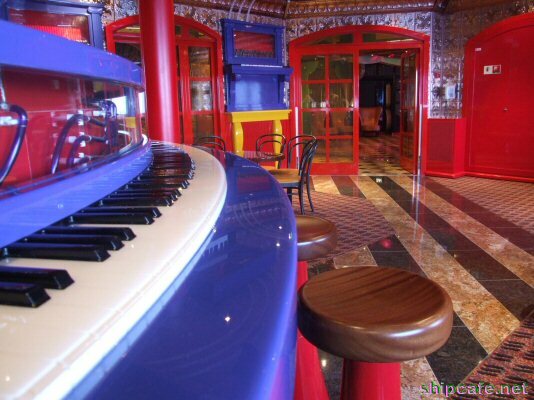 Scott's Piano Bar is located in the aft section of public entertainment areas and is a bold salute to ragtime composer Scott Joplin. 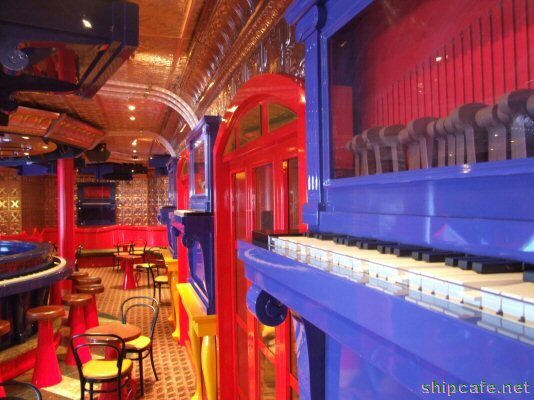 The 1910 décor includes wall appliqués of upright and player pianos, all connected by neon lights in the form of musical notes and scales. Pianos are even suspended overhead and a pressed tin ceiling and walls evoke an historic atmosphere. The Decades is a mini atrium that links the foyer of the International Lounge to the Posh Dining Room just one deck below. Swingtime jazz club takes guests back to the 1930s. 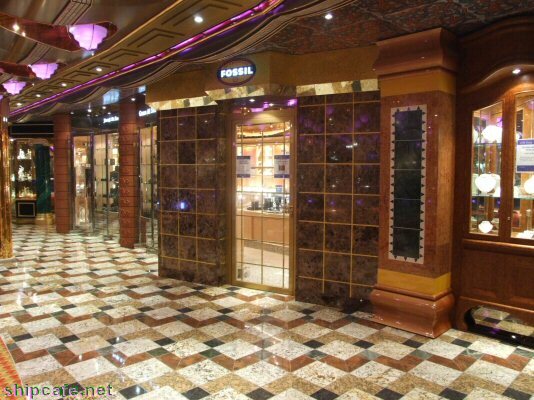 Polished woodwork and marble provide the backdrop for this particularly classy venue. 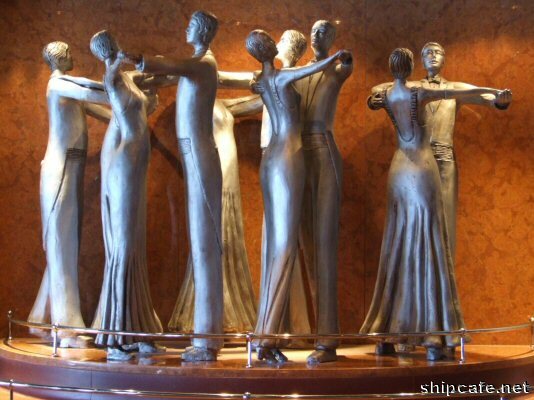 Wall sculptures feature cast plaster Art Deco style dancing couples in full dress. 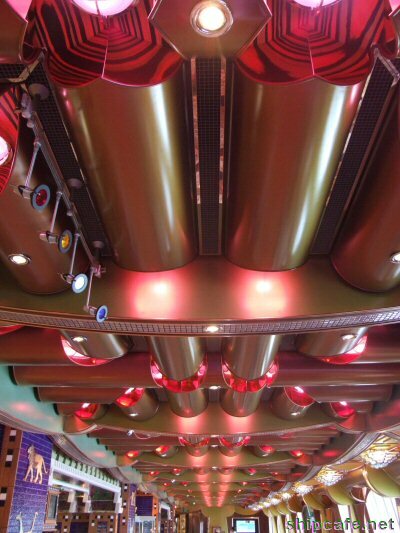 A main attraction in Decades is the color-changing sheer curtains, ceiling swags that change hue beneath colored lights. 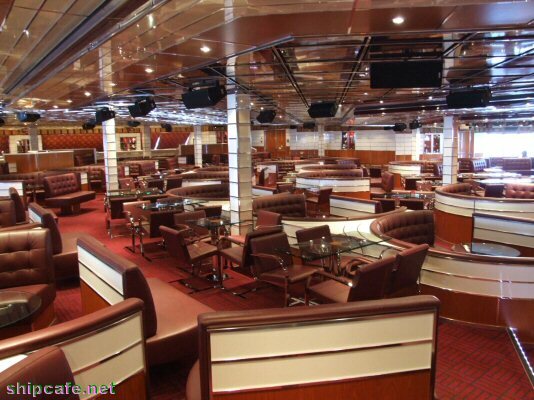 Completely aft on Promenade Deck is the alternative show lounge, International Lounge. 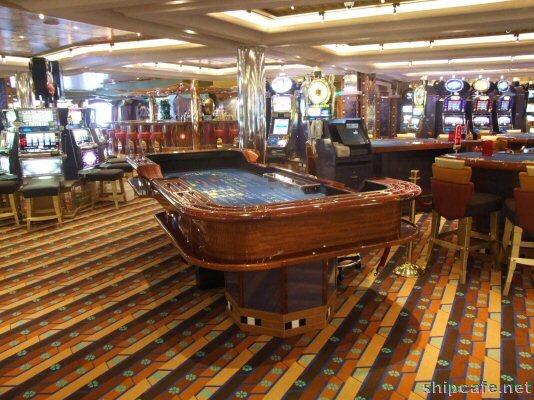 It hosts a number of cruise activities and cabaret acts. 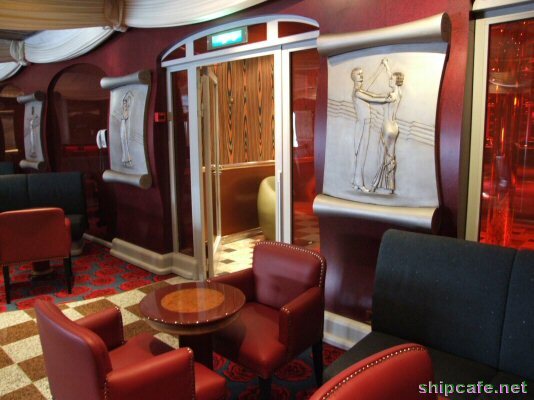 The International Lounge is 1920s inspired with polished stainless steel moldings, marble panels, and wood veneer walls. All such features provide a very sharp look of clean lines. Glass faced cabinets are filled with industrial designs of the era and reproductions of modern style art from the 'Roaring Twenties'.